Coming out of the mobile closet… into what? Dead iPhone, originally uploaded by mikeykrieger. So, a few weeks ago I acquired a certain much-discussed handheld telecommunications device made by a certain corporation based in Cupertino. It wasn’t a step I took lightly for a few reasons… for one, I had relentlessly mocked the hype around Steve Jobs’ announcements of said device to my Apple-loving friends and co-workers, and knew that I would be in for some frightful payback. (I was right.) Having grown up with a certain kind of knee-jerk anti-corporatism, especially when it comes to online technology (I came of age electronically in the glorious and heady days of 1992), I still can’t quite bring myself to use this device’s brand name in conversation or in writing. Sorry if that causes you any confusion. Maybe I should have held out for Android, or OpenMoko, but after Novak (a longtime Apple hater), gave me a personalised tour of how this thing worked, I simply couldn’t help myself. And yes, at the risk of joining the hype brigade, it is a damned (I damn thee, snazzy phone!) impressive machine… Before I had one, I would never have believed I would want to read anything on a screen smaller than my EEE (a device I love without complications)… but now I do get it. In fact, I prefer reading on the smaller screen, I can position my body anywhere and anyhow, as I would with a paperback. So, I’ve now entered a complicated but undeniably passionate relationship, tinged with self-loathing, with a wildly popular piece of technology… what now? I’ve accepted on an intellectual level that mobile technology was the future since Bryan Alexander blew my mind (as he tends to do) with his Going Nomadic talk at an EDUCAUSE event five years ago… now I feel it in my bones. But again, what now? What do I do with this? Is it just a matter of wider access, faster speeds, smaller screens, and shorter messages? I gather that geocoding will be more important, and that ‘place’ may reassert itself as a force in online environments… but in how many disciplines can geocoding be important? (Though seeing how some applications have ingeniously incorporated my GPS information into something cool on my handheld, I’ve learned these uses are not always obvious.) And I gotta admit, I’ve been ignoring a lot of the ground-level work in this field… and now I’m playing catch-up. I know about Jen’s project, who else should I be paying attention to? 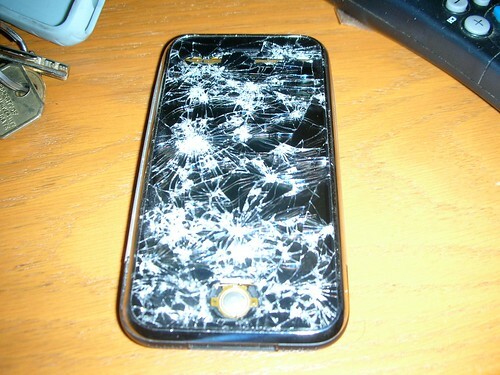 My name is Brian… and… I’m… an iPhone user. I feel somehow cleaner already. 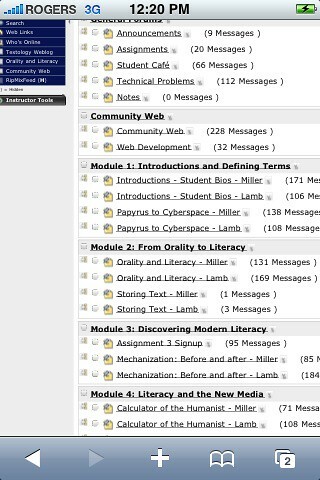 The desired task: check in on my courses on my iPhone to see if there are any new discussions, and then read them. First up, a course I teach on WebCT Vista. Between the various logins, and menus, It took me about than five minutes of intent hunting and pecking to get to this discussion screen. I suppose with bookmarking and more familiarity I could get that time down to about two minutes to get to this screen. (Though the system crashed frequently and usually forced me to go through the complete login process again to get back to the discussion screen.) But the problems don’t end there. I don’t intend to pick on the platform here, but navigating these menus, while not impossible, is not easy. Keep in mind that screenshot is larger than the actual size. For one thing, all those links are too close to one another for my big clumsy fingers – that’s a problem I have with other link-heavy sites such as the New York Times website as well — though at least I can pull RSS off of most news sites. Even when I can cleanly click the links, many of them simply don’t respond. I can’t figure out why some links work and others do not. Frequently, clicking a link to a specific discussion page sends me to a new Safari window to read it. Which would be great, except that when I go back to the window with the discussion menu the entire Safari screen reloads, taking me back to my initial course menu, so I have to navigate back to the discussion board nearly from the beginning of the process (at least it usually remembers my login). I meant to take more screenshots, but worry about student privacy, and to be honest I’m sick of the crashes and multiple logins. Call me lazy. I’m sure my own lack of skill with the iPhone is an issue, but I have to say that this system is a half-notch above completely unusable. If courses on this platform will ever be delivered to mobile learners, some sort of redevelopment or ‘mobile layer’ will need to be implemented. My quick search query turned up this short thread on a Blackboard discussion space, and it seems to confirm my assessment. To get from picking up my iPhone to seeing this screen is maybe ten seconds of loading time, and two link-clicks. And to be clear, while there are many free WordPress plugins and themes intended to enhance the mobile experience, as yet we have implemented none of them. We made no effort to develop a mobile platform. All we have is open access, clean HTML, and RSS. 17 Responses to Coming out of the mobile closet… into what? I am an iPhone user too … but have been since the get go. As one of my colleagues said after he got his, “iPhone, you complete me.” And trust me, that wasn’t a fan boy’s assertion. What I discovered early was that having access is actually really important. Before the iPhone I hadn’t recognized the affordances. Your discovery of the power of the mobile platform and then, ultimately, the disappointment that the information systems of the academy aren’t ready is also a shared experience. What I am wondering is if the iPhone is going to be the device that forces lots of faculty into more open spaces? I may be alone in this, but I can’t imagine how the big LMS/CMS venders can respond quickly enough to meet the need. Looks to me like there is an entire industry that is asleep at the wheel. The Kool-aid goes down nicely as you are swiping through photos listening to yer favorite burn down the establishment playlist. Try Shazam for identifying a song playing on the stereo by sampling and matching, or SnapTell which uses the camera to identify a book or DVD or CD by its cover. Or Mobile Fotos which can take a photo of say that funky thrift store on Commercial drive, geotag it automatically, and upload it to flickr (yes the camera quality is sub-par). Compose a WordPress blog post, embed a photo from the phone, and post it from the Vancouver bus. The video quality is astounding; on a plane there is no reason to look over smelly seats to a crappy display. Mostly, and subtly, the fact that you are connected to the net to consume or create content where-ever there is signal. The click point pain of WebCT is not the fault of the iPhone, as you have demonstrated before, it is tedious enough on a computer. If said boards had some RSS output, not only could you look at the3m in a reader, some clever soul might program a cleaner interface as an app. I’ve never fully grokked the firm line in the sand about Apple not being “open”. I don’t have a need or interest to hack it, or re-write it, and its interface/function is so elegant, I can live with what small things it may not do. 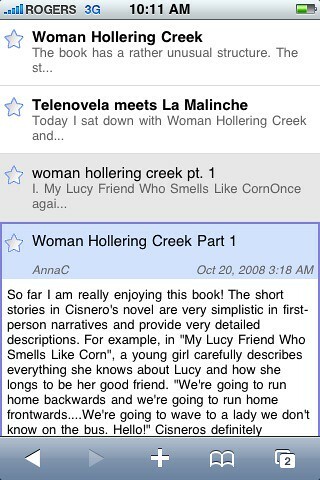 I love RSS and I love my iPhone. I can love a lot of things. And @Andre, ACU did not just wake up one day and say, “Won’t it be cool to dish our iPhones?” They did a ton of research and planning for how the phones would be supported and integrated, e.g. Heh. I heart iPhone, too. But regarding your love of RSS… the biggest practical glitch for me is that NetNewsWire doesn’t sync properly (if at all) between my Mac and my iPhone. Any clues as to how to fix that? Because, yes, the iPhone would be otherwise perfect for scrolling through my RSS feeds on the bus (even when I’m standing). I should say that I’m also even liking fairly much the Mail program on the phone: it’s not so hard to “type” short messages. Oh, and why exactly do you, of all people, teach a course on Vista?! 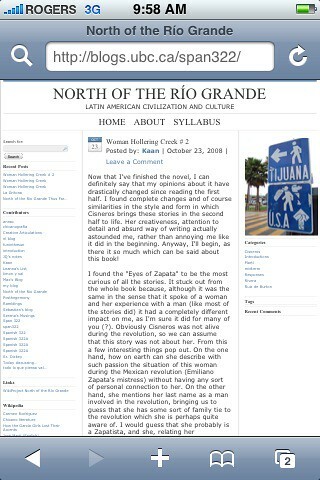 I’m pretty excited you blogged this. I saw your screen shots and discussion in the wiki for the bctech conference/discussion, on top of overhearing you mention this at the radical re-use session. I knew what you were saying about mobile learning was dead on, as you so often are. At the same time as I love the iPhone, I hate the money and investment an iPhone demands, it is crazy to think I would need to pay a few hundred books and another utility bill for a couple of years. Why? That said, despite the fact that EDUCAUSE 2008 was and is everything I hate about a conference and edtech, I did realize that my walking around with a brand new MacBook Pro made me a dinosaur. Just about everyone I saw had a shiny iPhone or iTouch, and they seemed far happier and healthier than me. I wanted to be them, and your demonstration of what it means for WPMu and a syndication oriented framework is important and compelling for mobile learning, this device changes the game–no questions. And I promise you that when I can afford one I will be less bitter. @Cole – I wonder if I’m being naive by thinking this is a moment to make the forceful case for the selfish, bottom-line, cost-oriented rationale of openness. How quickly could we put together a set of arguments and information that would convince the people that need to be convinced? @Alec – I’m afraid to jailbreak, for various reasons. But will give both those apps a long look. @D’Arcy – I know I can expect a few more of those. @Alan – I will follow up with a “my favorite apps” post, which is a huge part of the appeal. As an aside, I am deeply concerned to be called a fan boy twice in one thread. Surely I did enough Apple bashing to forestall such abuses on my own blog? @Jon – I hope someone else can help. I switched from NNW to Google Reader in part because I now jump between five different machines – three Apple, two Linux. Google Gears means you can enjoy the benefits of RSS even when offline. Why do I teach with Vista? a) Actually, student projects for that course are on the open web, and we run public blogs, wikis and lots of other activities on public new media sites as part of the course. The decision to release course content is not mine because I did not author most of it (we might open it up in the future), and students in this program still prefer closed threaded course discussions (see my previous post for our efforts to develop an alternative). b) I would prefer other approaches, but I am honestly glad to have the opportunity to teach using Vista now and than, as it informs my opinion of it with real experience. I could not have made the comparison I do above without that experience. @Jim – your comment reminds me to explicitly state another of one of my misgivings, which is the money involved with being any kind of player in the mobile game. I am privileged to be able to play with this tool. It is a luxury even within a wealthy culture like the one I live in. And while I generally believe in going where the students are when it comes to technology, I hate to think we create a context where people feel obliged to spend stupid money before any kind of real value can be established. Yet another economic barrier to education. We need to remember that pushing this in the current environment perpetuates yet another form of digital divide. 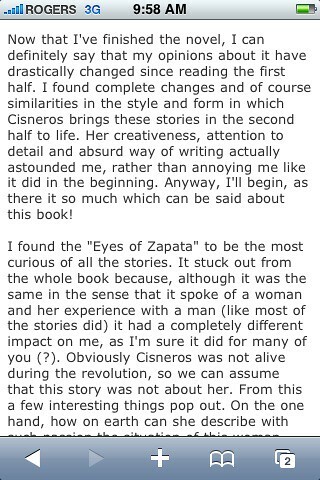 That’s a big piece of the self-loathing I am groping to articulate here. 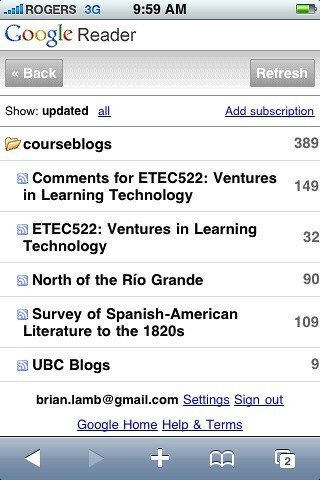 For RSS on the iPhone (er, I’m just slumming it with an iPod Touch…) I swear by Google Reader – There’s native iPhone app called Byline that syncs feeds and items for offline reading, and gives a great UI to check feeds. It took time, but perhaps we’re getting to mobile learning. Then nomadic teaching and learning. Thanks for reporting on your experiences with the fetish-phone. Andre’s question is a good one. It’s important to refuse hype’s power to cloud tech minds. Are we talking about the iPhone dominating this market, a la iPod? Or is it a marginal platform in use, influential in impact, as OSX? If it’s the latter, we’re still working in the Balkanized world, having to look into iPhone *and* Android*s* and Crackberry and Windows Mobile. @jim, I used that conference detail to trade on our futures markets. They got to you too! Dammit! I’m radio-ing to headquarters, situation hopeless. Thanks Mr. Equipments! I was a little worried you might be a spammer, so I deleted your URL from my database. But I hope that someone so admiring of my work will forgive me that one indulgence? Pingback: “When I’m drivin’ free, the world’s my home” …more on going mobile.